Each year from May through September, Fremont Street Experience transforms Downtown Las Vegas into the hottest place to be with the Rock of Vegas free summer concert series; one of the most popular summertime events in Las Vegas featuring four months of rockin’ nightly entertainment, free headliner concerts and Viva Vision shows. This year’s concert series kicks off Sunday, May 18 with Marianas Trench and will also include a Memorial Day Weekend performance from hit pop-duo Karmin on Saturday, May 24 as well as 3 Doors Down on Saturday, June 14 and the Summerland Tour 2014: featuring Everclear, Soul Asylum, Eve 6 and Space Hog on Friday, July 18. English rock band and one of the pioneers of rock music, Deep Purple, joins the stellar lineup of bands performing in the Rock of Vegas summer concert series at Fremont Street Experience. 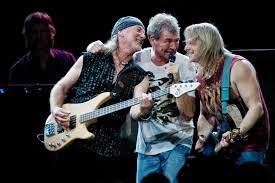 Renowned for hit songs like “Smoke on the Water,” “Highway Star,” “Fireball,” and “Speed King,” Deep Purple will rock audiences on Friday, August 15 on the 3rd Street Stage at 9 p.m. in fabulous Downtown Las Vegas. Additional concerts to be announced soon.